(Left to right): Warren Nash, Ben Beausir, Austin Horvat, Ellie (Horvat's niece), and Mariam Gorjian, of the Von Allmen Center for Entrepreneurship. LEXINGTON, Ky. (April 24, 2018) — This past weekend, some 30 teams of students representing colleges and universities from across the state competed in the Business Model and Business Plan tracks of the Idea State U Business Plan Competition, hosted by University of Kentucky’s Gatton College of Business and Economics. 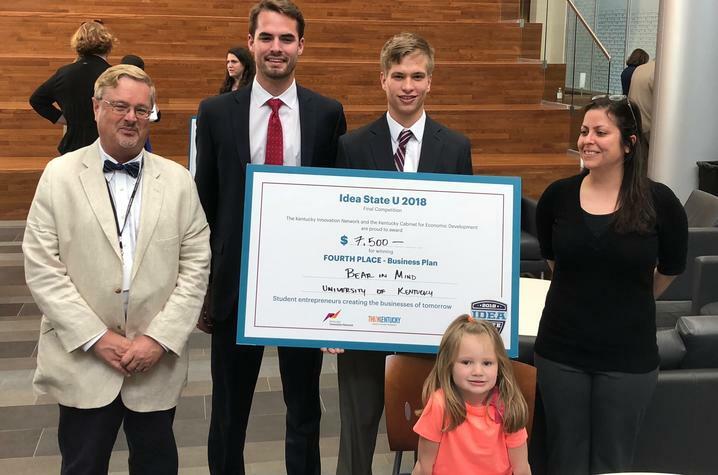 Bear in Mind, an entrepreneurial team featuring UK College of Engineering undergraduate Austin Horvat and Gatton undergraduate Ben Beausir, captured fourth place in the Business Plan track, earning $7,500 for their startup. In all, six teams of UK undergraduates and graduate students took part in Idea State U. Three of these teams have formed companies, with the other three looking to form startups. Up next for these budding entrepreneurs is the Alltech Innovation Competition this Saturday, April 28. Bear in Mind will be joined by another UK team, Sustainable Products, as they pitch their business ideas to another panel of expert judges.